Chain Reaction Cycles Black Friday deals are very good indeed and when they go live each year this is where you will see the best of them. Not only will we add what they have to offer you can also comment below with all the deals you come across from their store or website. 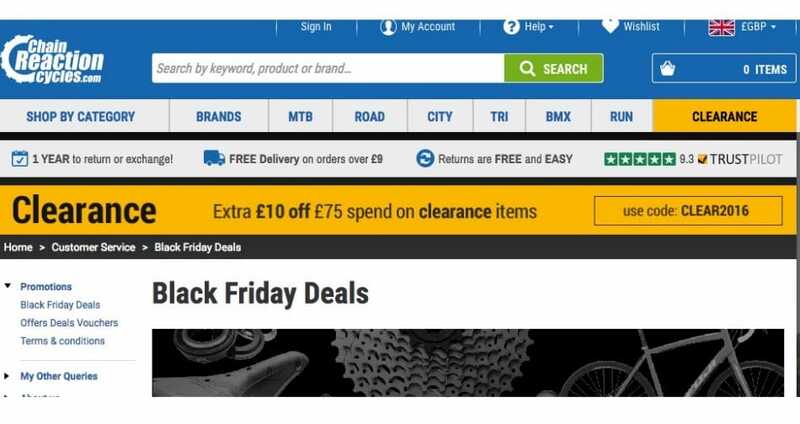 In 2015 Chain Reaction Cycles took part in the Black Friday UK sale event, where they offered its customers low-cut prices on brands such as RockShox, Shimano and SRAM as well as great discounts on road wheels and for mountain bike riders low-priced disc brakes. You can bet each year will get better and better where you will get amazing deals on Road, BMX and Mountain Bikes and accessories. Check back here regularly for our BFUK updates as well as the official Chain Reaction Cycles Black Friday webpage. Wow, the Northwave Hammer SRS MTB 2016 Shoes are part of the black friday hot products and the price has been reduced from £139.99 to just under £50. The Black Friday page is now showing week 1 of Black Friday deals is now live. Week 2 will begin November 10thm week 3 17th and week 4 the 24th. You can also get up to 65% off suspension forks. I saved a huge 69% after purchasing the 2015 Fox Suspension 32 Float CTD FIT Factory Forks for just £219. If you are into road bikes then you will love the up to 65% off road clothing with chain reaction. There are offers on MTB clothing where you can save up to 70% off.